All transactions are safe and secure with a reliable history in online purchasing behind each of our associates. Buy the Mr. 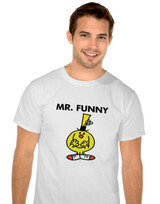 Funny t-shirt to own Mr. Men clothing and merchandise. If you were known as the class clown or your friends look for you to cheer them up, then this Mr. Funny t-shirt is for you. In this Mr. Men book, our lead character makes everyone laugh with his shoe shaped car and backwards comments, but apparently funny faces are his forte. This true skill is demonstrated when he is able to cheer up every sick animal in the zoo solely through his facial distortions. If you wish this sounded like you but it doesn't, then check out the rest of our Mr. Men t-shirts. You might prefer the Mr. Grumpy t-shirt below or other Mr. Men clothing. In addition to the Mr. Funny tee above, browse the Mr. Men Clothing Gallery for more apparel like men's and women's clothes, kids shirts or hoodies.